Ohio Wesleyan University is embarking on an exploratory study to reduce waste on campus and across the nation by drawing inspiration from green practices in East Asian countries. 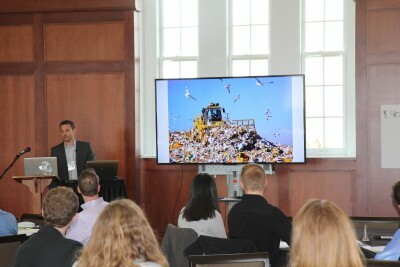 On Nov. 13, OWU hosted a symposium titled “Exploring East Asian and Western Perspectives on Waste, Sustainability, and Environment.” The event’s eight presentations explored different disciplinary approaches to improving the environment in different areas of the world. The conference was funded by an Exploration Grant previously awarded to OWU by The Henry Luce Foundation. 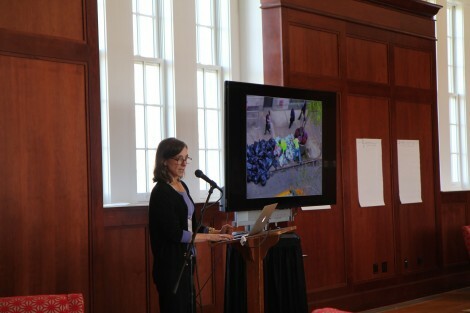 Robin Nagle, Ph.D., anthropologist-in-residence with the Department of Sanitation of New York City and director of the Draper Interdisciplinary Master’s Program at New York University, served as the keynote speaker. Her talk revolved around the constellation of issues concerning U.S. sanitation workers in popular consciousness. She posed questions such as: Are sanitation workers appropriately valued? How are they commemorated? What stories do we tell about them? Employing a dramatically different approach to the U.S. “waste question” were Kyle O’Keefe, director of innovation and programs for the Solid Waste Authority of Central Ohio, and Jenna Hicks, director of Delaware-Knox-Marion-Marrow Solid Waste District. O’Keefe outlined the mechanics of garbage flow in Central Ohio, and, more generally, discussed the waste management dilemma in the United States. Hicks emphasized a need to change the way citizens are involved with waste collection. A higher level of citizen involvement, Hicks argued, would permit certain types of recycling to be possible and reduce the pressure on garbage collection crews. Christopher Hartmann, a waste researcher and Ph.D. candidate in geography at The Ohio State University, discussed waste-pickers at the La Chureca landfill outside Managua, Nicaragua. His research focuses on the social problems and environmental hazards produced by La Chureca, a site of persistent poverty despite government aid. Hartmann predicted similar zones may emerge throughout the Global South. Ching-Hsuan Wu, Ph.D., academic director of the Chinese Flagship Program at Western Kentucky University, highlighted Taiwan’s rigidly diligent garbage disposal system. A former OWU professor, Wu provided a practical explanation of the channels through which garbage “flows.” She helped the audience understand that for the complex system of garbage flow to work, the people of Taiwan must follow a tight framework of rules. This lattice of regulations, she noted, radically reshapes the way Taiwanese people relate to garbage. Having observed and experienced a similar system in Japan, Eric Cunningham, Ph.D., assistant professor of Japanese Studies at Earlham University, discussed the social relationships that allow the highly regimented systems to function. Using a variety of sources, he explained how the “trash collectives” form into grass-roots networks that enforce the garbage systems. Ohio Wesleyan faculty members Ji Young Choi, Ph.D., and James Peoples, Ph.D., gave a joint presentation on their summer travels to South Korea. During their trip, they connected with a professor from Yonsei University, who will work with OWU students on research projects in South Korea related to the Luce Grant. Choi delivered a concise history of waste management post-1990, covering advances in waste technology and different programs that the Korean government has implemented for residential versus commercial disposal. The symposium was organized by Peoples, director of East Asian Studies; John Krygier, Ph.D., director of Environmental Studies, and Nick Crane, Ph.D., visiting assistant professor of geography. The daylong symposium was attended by approximately 50 people from Ohio Wesleyan and other Ohio Five colleges.